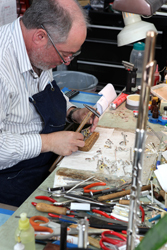 We repair all manufacturers including handmade, intermediate, and beginning flutes and piccolos. Straubinger pads for flutes and piccolos or traditional felt pads are available upon request. Contact us for shipping information. Your used flute or used piccolo can be repaired to like-new condition for your continued enjoyment or to get it ready to sell in our used flutes and piccolos area. • Flute Specialists, Inc. has one of the nation’s largest inventories of new and used instruments. We encourage our customers to find the instrument best suited to them by encouraging them to try many different models of instruments and even shipping instruments for in-home trials. Each instrument receives our pre-purchase service to ensure performance-ready playability. • Used flutes and piccolos at Flute Specialists are never sold “as is”. Our substantial inventory of used flutes, piccolos, and headjoints are serviced, repaired and include our warranty on adjustments all included for free with purchase. • Our internationally know service shop performs expert, guaranteed service and repairs on all makes and models of flutes and piccolos. • We provide clinics on emergency repairs and tips for how to purchase a new or used instrument. We travel to collegiate and home studios as well as flute clubs in order to share our knowledge with flutists around the country. All inquiries are welcome! “All flutists, whether professional musicians, educators, amateurs or intermediate or beginning level players, deserve the services of a highly skilled and experienced repair facility for all repairs from minor adjustments to complete overhauls. This level of expertise is also essential for proper pre-purchase service or warranty adjustments on new and used flutes and piccolos.